Being situated inside a National Forest has its perks, one of which being there are very few man-made lights outside. 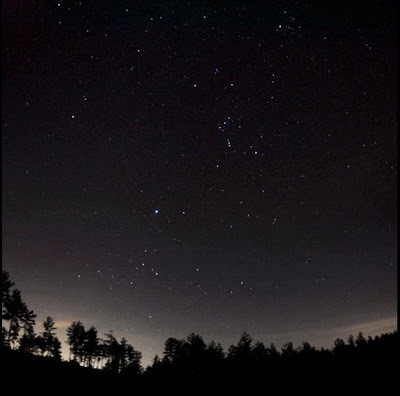 Instead, the sky is lit by thousands of stars on a dark, clear night, making the Inn on Mill Creek a great place for stargazing. February 16: This is the best night in February for viewing the our solar system’s innermost planet, Mercury, at a time known as greatest elongation (when the planet will be at its furthest angle from the Sun). Other dates to catch Mercury in the night sky this year are June 12 and October 9. March 10: Watch the evening sky for Comet PAN-STARRS as it makes its closest approach to the sun. Look just to the left of the setting sun. You should be able to view the comet in the evening sky through the remainder of March. May 4-5: The Eta Aquarids Meteor Shower, which Is caused by leftover dust particles from Comet Halley, can produce 30-60 meteors per hour at its peak, depending on where you live. After midnight, watch for shooting stars radiating from the constellation Aquarius. May 25: On this date, the full moon will be passing through Earth’s partial shadow in what’s called a Penumbral Lunar Eclipse. Not a full lunar eclipse, but worth seeing nonetheless. Another Penumbral Lunar Eclipse can be viewed this year on October 18. May 28: Venus and Jupiter will be very close to each other in the western sky in an event called a conjunction. The two planets will be within 1 degree of each other, and the best time to see them is at sunset. Plus, Mercury shows up at this time as well. July 27-28: You can see up to 20 meteors per hour during the peak of the Delta Aquarids Meteor Shower, produced by comet leftovers. Like the Eta Aquarids in May, you’ll want to watch for meteors after midnight, radiating from the constellation Aquarius. August 11-12: If the night sky is clear, you do not want to miss this year’s peak of the Perseids Meteor Shower. The moon will be in its first quarter phase, setting shortly after midnight, so the skies will be nice and dark. We have Comet Swift-Tuttle to thank for this particular meteor shower radiating from the constellation Perseus; the Perseids can produce up to 60 brightly shooting stars per hour. Fall Meteor Showers: There are three meteor showers taking place in the autumn skies. The Orionids Meteor Shower, produced from Comet Halley dust particles, will peak on October 21-22. Then, on November 4-5, watch the night sky after midnight for the peak of the Taurids Meteor Shower, which is actually two meteor showers in one. It doesn’t produce a lot of meteors, but is a long show, running from September 7 to December 10, and the peak night will be dark with no moonlight. The third meteor shower, the Leonids, will peak this year November 16-17. Unlike this year’s Taurids, there will be a full moon during the peak of the Leonids so seeing shooting stars might be a challenge. November 28: In October, Comet ISON will become visible to the naked eye, reaching its close encounter with the sun on November 28. There are predictions that this will be an especially bright comet that might be visible during daylight hours as well. December 13-14: Don’t let the cold wintry weather discourage you from viewing the Geminids Meteor Shower…it’s the best of the year. You could possibly see up to 120 meteors per hour radiating from the constellation Gemini on the peak evening each year, depending on how bright the moon is. This year, the moon will be more than half full, but this is an especially bright meteor shower, so expect to see shooting stars if the sky is clear after midnight.